South Korea's LG Electronics said Friday it would correct a "bug" on some of its smart TVs after admitting they send information about viewers back to the company without their permission. The world's second largest TV maker launched an investigation after UK-based IT consultant Jason Huntley raised the issue in a blog. He said LG continued to collect information on which channel he was watching even after he turned off the data collection feature. "We have found some of our smart TVs continue to transmit viewing information even when the function is turned off by the viewer," a spokesman said. "We are preparing a firmware update to roll out soon that will correct this bug." Huntley welcomed move as the "positive step". 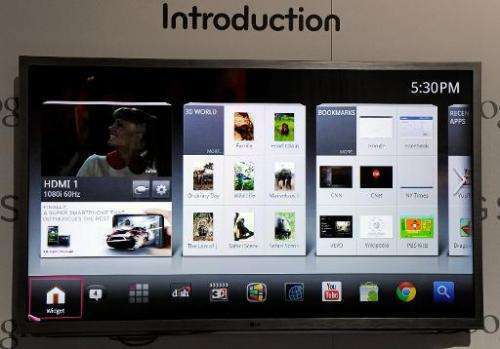 LG's rival Samsung Electronics, the world's largest TV maker, said its products had not experienced such a problem. "Samsung takes all concerns regarding consumer privacy and data security very seriously," it said. "All of our smart TVs include industry-standard security safeguards and practices to secure consumers' personal information and prevent its unauthorized collection or use," Samsung said in a statement.